Saturdays are lazy days for me but woke up early, along with my super excited son to be one of the nearly 2,000 Davaoenos who run for a cause during the first-ever regional McHappy Day Stripes Run held at People’s Park here in Davao City on Nov. 28. McHappy Day Stripes Run is an annual family fun run held every year with a noble objective of helping more Filipino kids learn how to read. 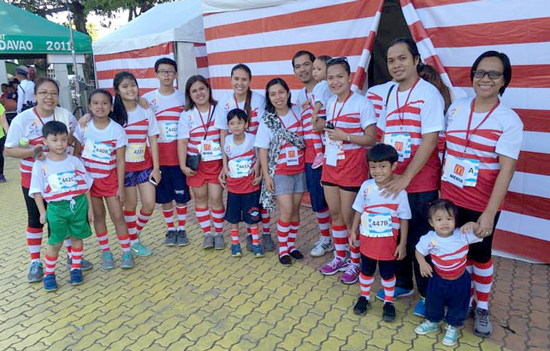 More than a much-awaited fun run, McHappy Day Stripes Run is a fundraising event of McDonald’s Philippines to fuel support for its flagship program, Ronald McDonald Read to learn. The Program, in partnership with the Department of Education, teaches beginning reading to Grade 1 and 2 public school students. Through the Stripes Run in Davao and Manila, happening in December 5, McDonald’s aims to raise 2 million pesos to share the gift of reading to more kids nationwide. Since 1990, McDonald’s has touched the lives of 11.5 million students among 7,500 partner schools. “McDonald’s has always had a special spot for children. We know that the best way to contribute growth and happiness to their lives is to help them learn how to read. Through the McHappy Day Stripes Run, McDonald’s does just that while allowing families to help in a fun and memorable way,” said Kenneth Yang, McDonald’s Philippines President and CEO. Various activity booths like Birdie the Tower and Ronald Recall welcomed participants of all ages after the race. The activity was hosted by Actress Jackie Lou Blanco and Mikee Aportadera. McDonald’s prepared fun and exciting surprises for each family member, making sure that everyone brings home great memories and the assurance that they were able to help kids in need.